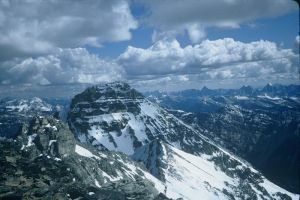 This peak is #72 on the Height List for Alberta .The first ascent of Allen (Shappee) was made by Miss G.E. Benham, accompanied by the guide Christian Kaufmann, in July of 1904. Their route took them up the 3-4 couloir, across the Fay glacier, and then up the W slopes of the objective. Name Notes: Mt. Allen was, according to Boles, et al., in Place Names of the Canadian Alps, named for Samuel Evans Stokes Allen (1874-1945). A graduate of Yale, he hailed from Philadelphia and was an exploratory alpinist and the pioneer of present-day nomenclature in the Lake Louise region. In the years from 1893 to 1895 he, along with Walter Wilcox, prepared two maps of the area. Originally Allen called this peak Shappee, which is Stoney for 'six' this being the sixth peak in the Valley of the Ten Peaks. Sadly, Allen's parents disapproved of his interest in alpinism, a condition which brought on severe depression . . . . He spent the final forty years of his life in confinement for insanity.